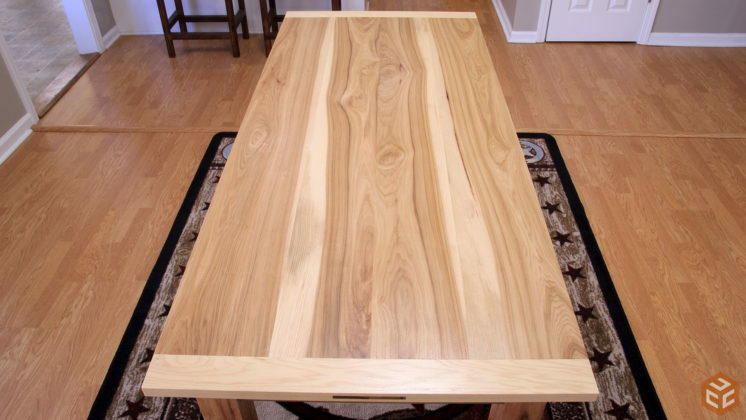 Previously, I completed my dining table top. I wanted to try something different with the top so I went with a wedged through mortise and tenon breadboard end. It was a fun joint to make and it turned out great. 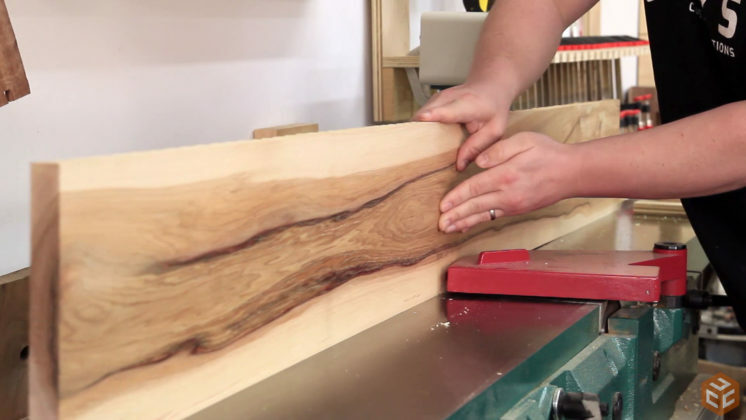 If you haven’t already seen it and are interested I made a video and article specifically focusing on that joint and the rest of the dining table top. You can see it by clicking here. The top was made with hickory as the primary wood and walnut as the secondary accent wood and I continued that theme with the base. If you follow me on Instagram or on my second YouTube channel you’ll know that this dining table has gong through a ton of design changes. In the end we settled on a super simple four leg design that lets the focus of the project be on the wood and not visually busy design elements. This is the third table I’ve built with this basic design. I have a set of plans available at the end of this article that covers three different table sizes and walks you through the entire building process including the wedged through mortise and tenon breadboard end. I purchased enough lumber to make hollow box style legs however I ended up having a better solution. A local woodworking friend of mine Shawn Stone gave me a nice sized 3” thick slab of hickory not too long ago. 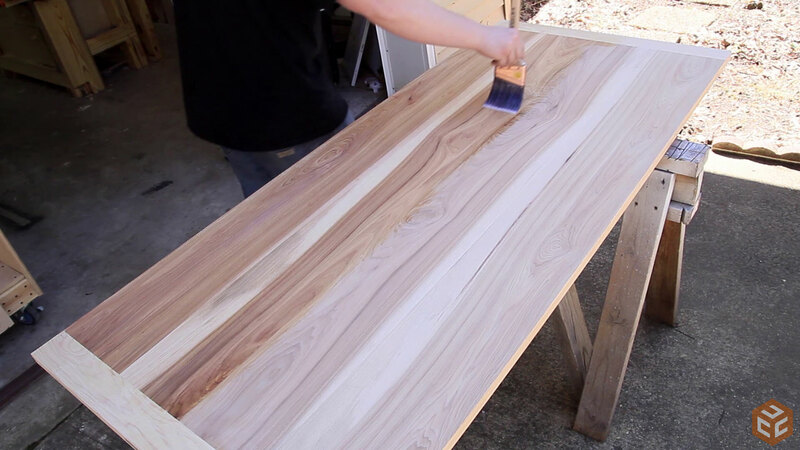 I originally wanted to use the slab for a live edge table top of some sort but because it had so much twist in it I realized it would be too wasteful to try to flatten it so I realized it would be perfect for table legs. Hickory is some pretty heavy wood. Especially in the 3” thick slab form. Much too heavy to run through the bandsaw like this. So step one is to cut off a more manageable chunk to take to the tools. To do so I used my circular saw at full depth to make one saw cut line. This wasn’t deep enough so I finished the cut with a reciprocating saw. This is a pretty old Black & Decker saw I got from my grandfather. No woodworking ties though as he used it to process deer. It’s a big, heavy body saw so the amount of vibration this thing puts out is MUCH less than my battery-powered Ryobi version. To further the rough cutting process the bandsaw is used to cut out the oversized leg blanks. I didn’t have my resaw blade installed but that’s OK. The thin blade I was using only had four teeth per inch so it handled the cut just fine. 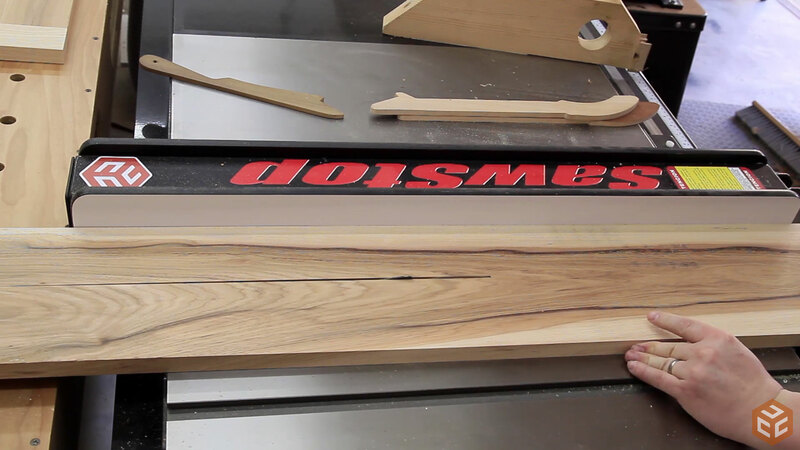 Next up in the milling process is to square two faces at the jointer making sure they are 90 degrees to each other. Normally I use my planer to get the remaining two faces flat, square, and parallel on pieces of this shape but I chose not to for this task. The reason being is that I didn’t want to take the chance of small pieces of dirt in bug holes dulling the blades really fast. The planer I have doesn’t have great blade life. Instead of using it I used my table saw. 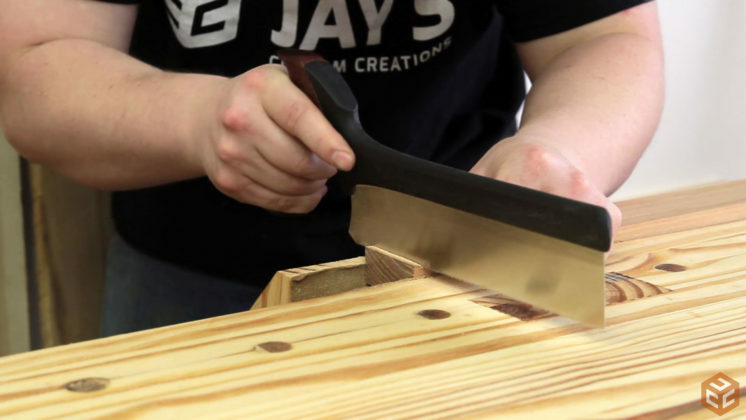 When making cuts on the table saw where the blade is not inside the wood on the left and right faces of the blade you will always get the dust spraying out the side of the blade instead of going down into the table. I knew this was going to happen so I wore my dust mask before making these cuts. I honestly should be wearing that more often than I do. At this point the legs were square on all four sides so I left them to rest over night. 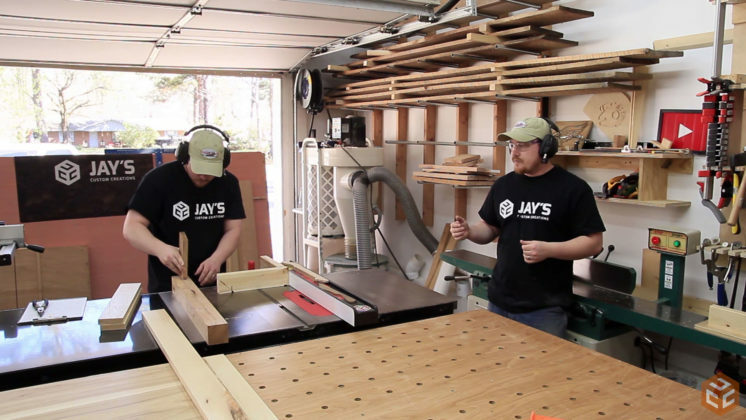 Letting them rest before cutting the joinery allows for the wood to release any internal stresses and possibly warp or move as needed. That way you can go through the milling process once more to remove any warp that may be there after the first milling process. 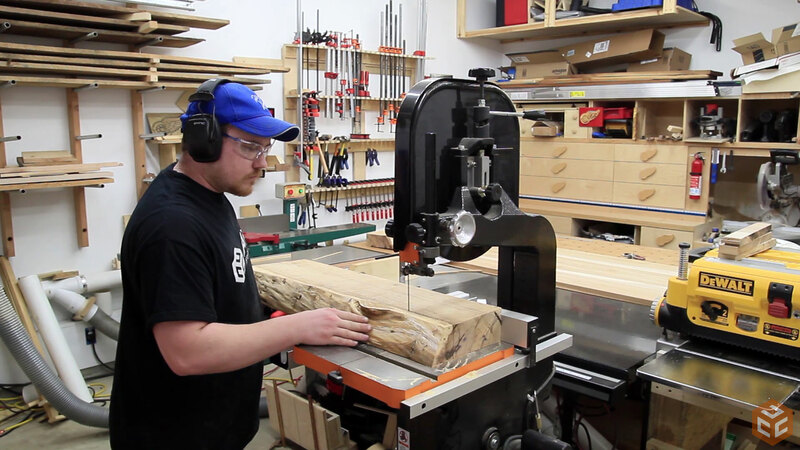 When dealing with rough cut lumber you often get more stable material if you break the milling process into multiple stages over a few days. At this point I was a little concerned with the amount of bug holes and insect damage that the hickory had. In the end it turned out beautiful though. A quick note on grain selection for legs. 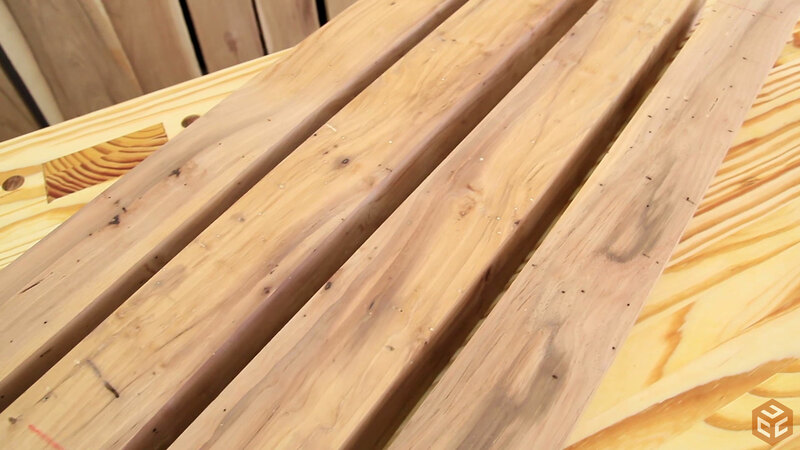 When picking out lumber for legs it’s best to get boards that have the growth rings around 45 degrees to the faces. This way the exit angle of the grain is roughly the same on all four faces of the leg which will result in a leg that has a visually consistent appearance on all four faces. The two legs in the right of this image are a good example of this. The scrap block on the left is a quartersawn piece of material. In this situation the top and bottom of the wood have a very straight grain look and the two sides will have a cathedral look to the grain. This is often sought after in certain situations but not on table legs. 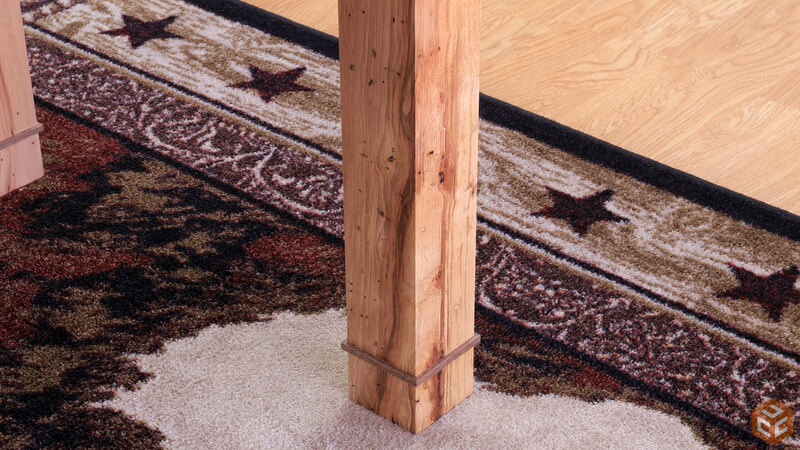 The four faces of this scrap block will have two distinct looks which is not what you want on table legs. The joinery for the leg to apron connection is a mortise and tenon joint. 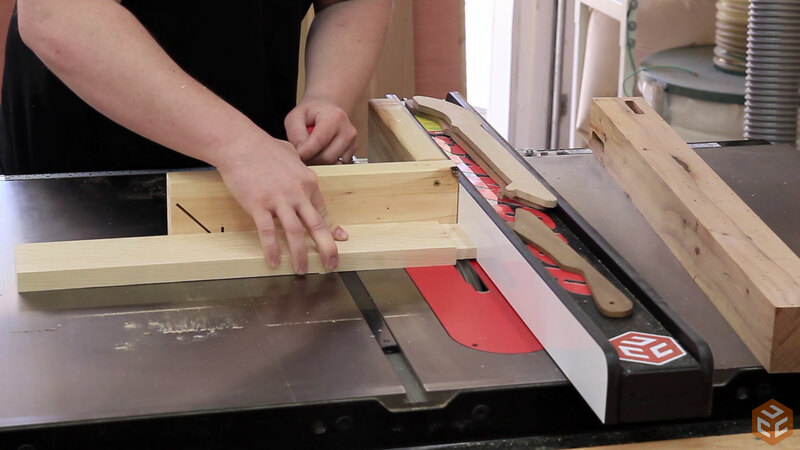 A mortise and tenon joint can be cut in a variety of different ways but the route I’m going with is a plunge router and my homemade edge guide for the mortises and a table saw for the tenons. With the leg mortises done I can start on the apron rails. I chose the most visually interesting piece I had for the long rails and a piece of 100% white sapwood for the short rails. 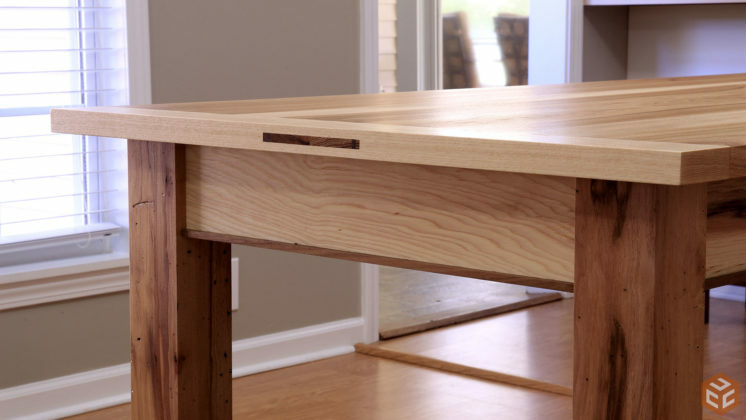 I figured the sapwood short rails would tie the base into the top pretty well considering the breadboard ends on the top are all sapwood as well. 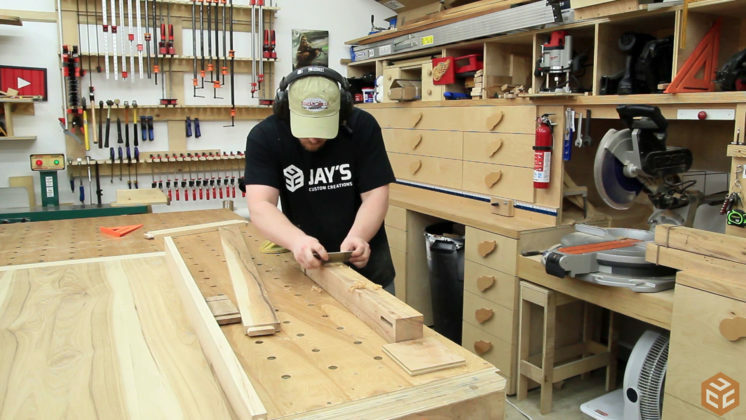 The first step for the apron rails was skip planing both wide faces and then jointing the edges at the jointer. 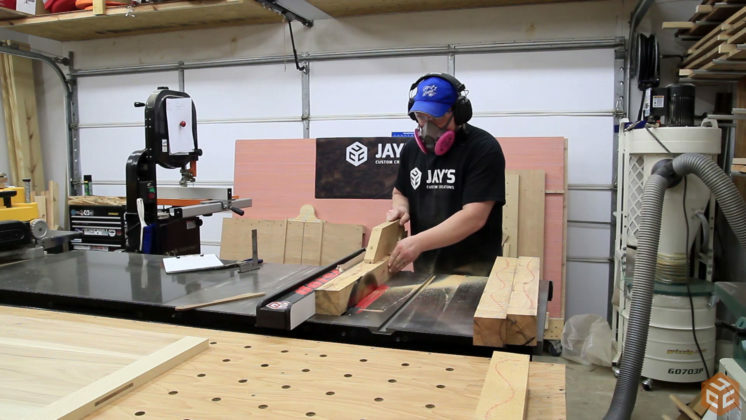 The boards are ripped to their final length at the table saw. I wish every piece of hickory I had was as beautiful as this one board is. To cut the tenons on the ends of the rails I used my table saw and a dado stack. It’s a pretty easy process once you get it dialed in. I used an offcut that was the same exact thickness as my rails to really dial in the dado blade height to produce a slip fit on the joint. Not too tight that you have to force it but tight enough that I can pick up the other half of the joint with the tenon piece. 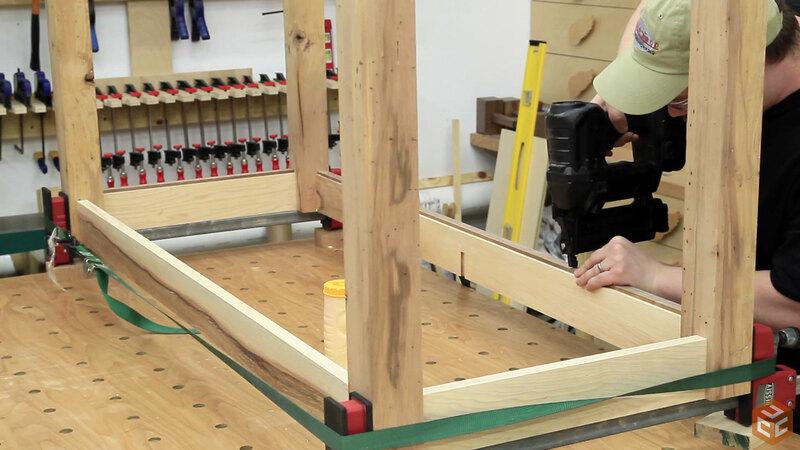 When the height is set all of the tenons can be batched out pretty fast. 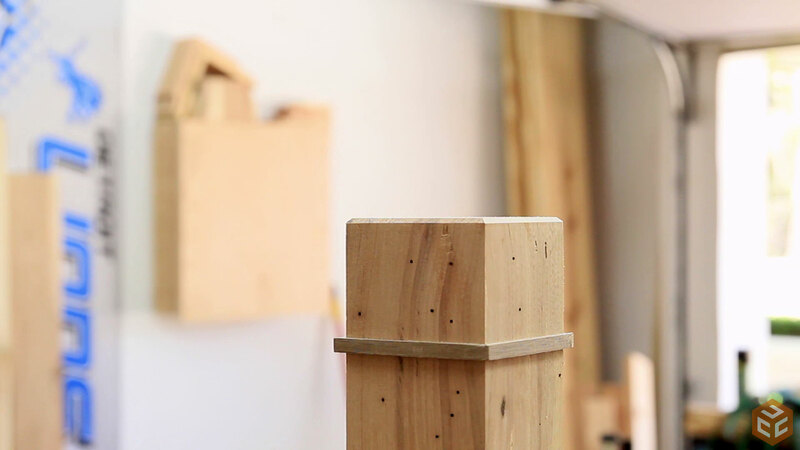 The tenon dimensions I chose were a little bit offset from the top of the joint to give a little more structure to the mortise to prevent racking. 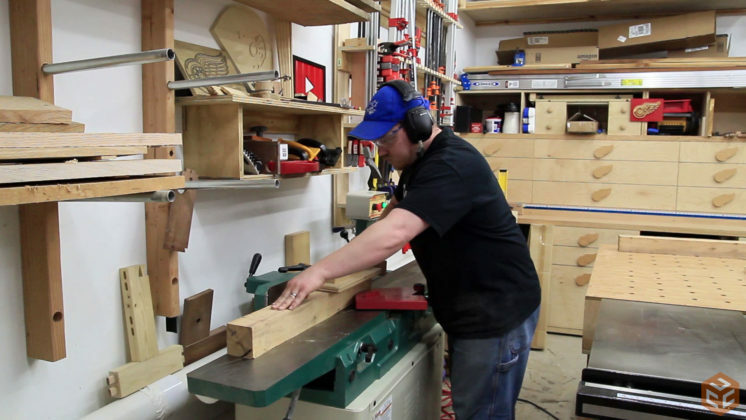 This means the tenon needed to be trimmed a little bit. 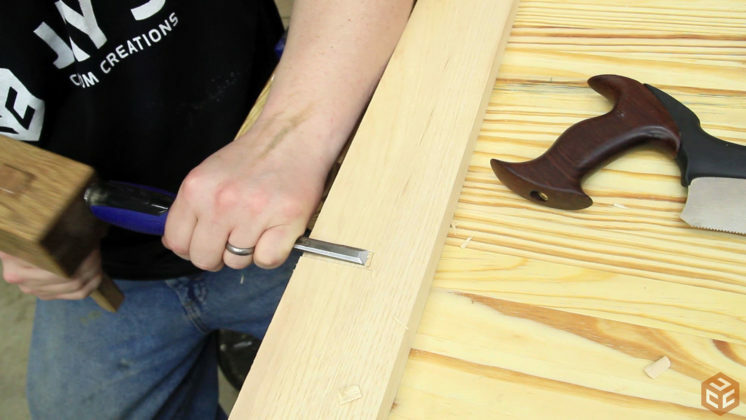 A round router bit creates a round mortise. 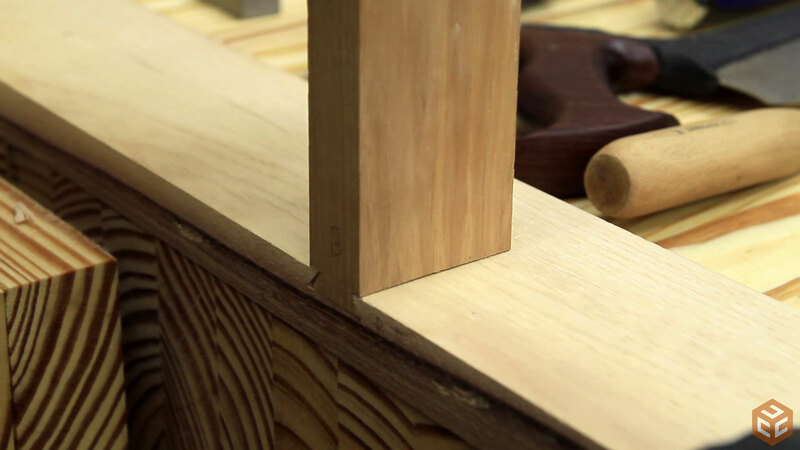 It’s much easier to round over the tenon with a chisel than it is to square the mortise. I chose to add a subtle inlay detail a few inches from the bottom of the legs. To cut this I reduced the dado stack to 1/4” wide and made a 1/8” deep groove around all four faces of the legs. Walnut was used for the inlays. Cutting these small pieces is MUCH easier with a hand saw on a small homemade miter board than using the powered miter saw. And it’s just as fast. Once all four faces had the strips fit I glued them in place. At this point I changed my mind once again and chose to leave the inlays proud of the leg and not trim them flush. Most of the time it’s much easier to do sanding or scraping to individual parts rather than a completed project. So that’s what I did. All of the legs and apron rails got some surface treatment with a card scraper. No sanding. A dry fit confirmed all of the joinery was alright. 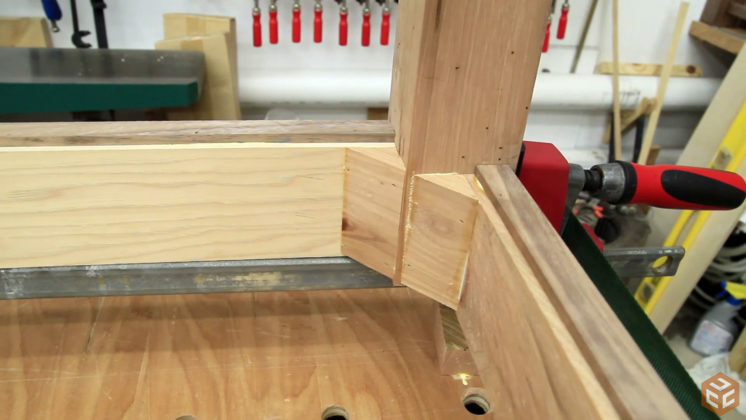 At this stage I cut the interior support board to length leaving room for the sliding dovetail. 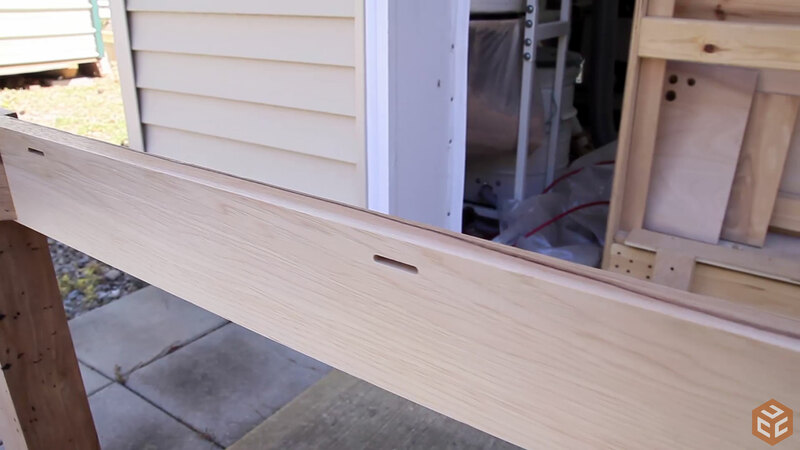 The entire purpose for this piece is to prevent the long rails from bowing out or bowing in over time. It also adds a little bit of support for the top. 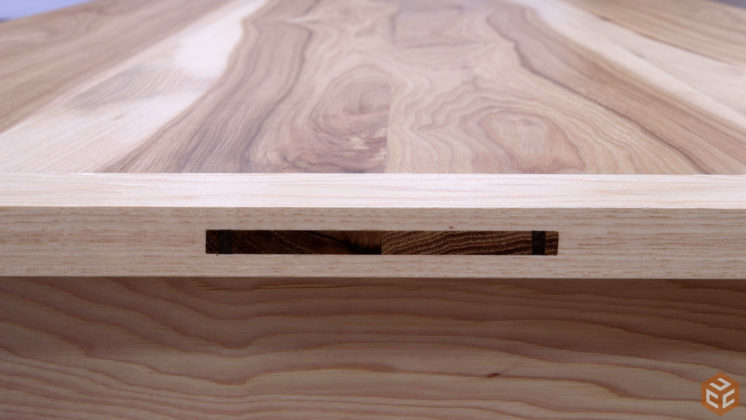 I’ll start the sliding dovetail on the male end, or dovetail end, of the joint. 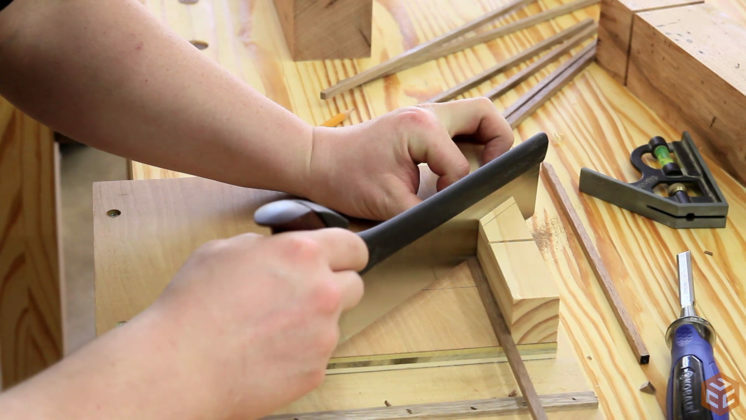 The marking gauge is used to establish the shoulder locations first. 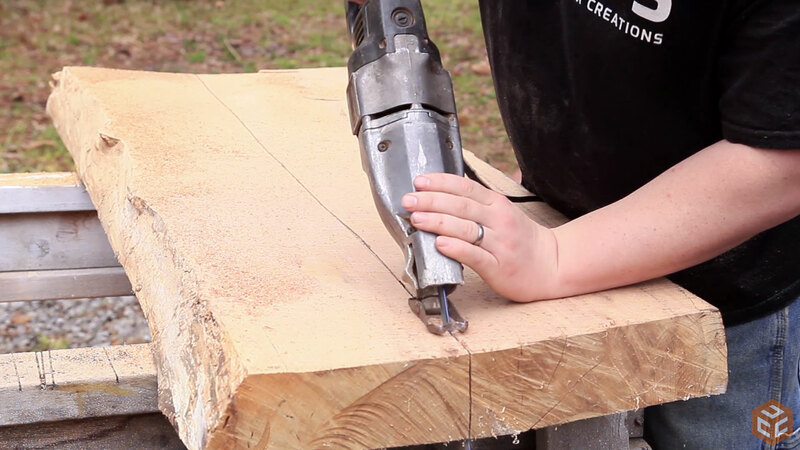 Then a hand saw can be used to make the shoulder cuts. And the widest chisel I have is used to make the angled face from the top outside corner down to the bottom of the saw kerf. This is actually a really easy process. Once the dovetails are cut they can be transferred to the long rails with a marking knife. 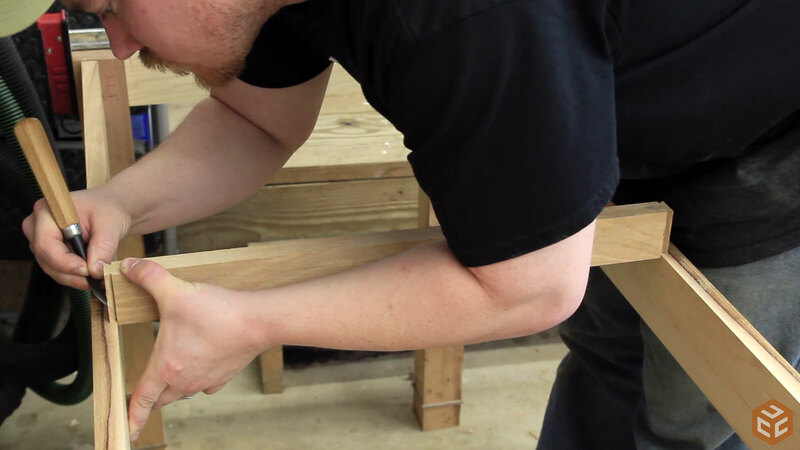 cutting the dovetail socket is a little more tricky. 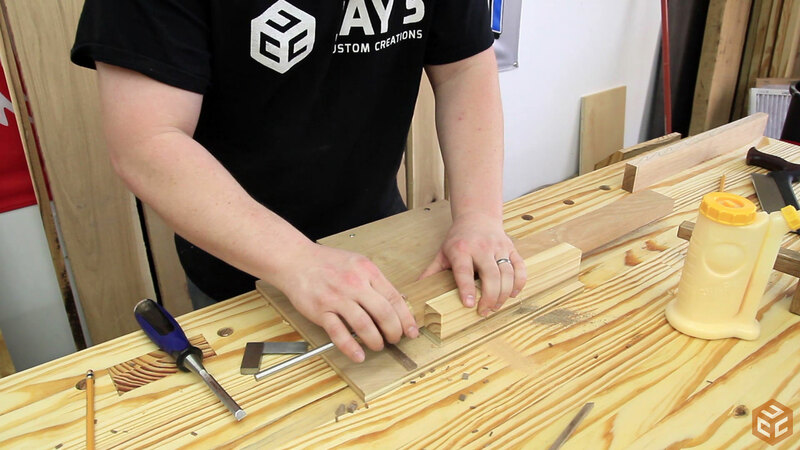 With the perimeter of the joint laid out I very carefully made the two angled cuts as deep as I could go with the saw. A test fit confirms a good fit. It’s not perfect but structurally it will do the job just fine. And like I said, once I put the top in place nobody will ever know it is there. Assembly of the base starts with gluing the short rails into the legs. I don’t have any clamps long enough to span the length of the long rails so I used a ratchet strap from my truck to hold everything together while the glue dries. To add a subtle decorative touch I added walnut accent strips to the bottom of the rails. This is a long grain to long grain glue joint so glue is all that is needed but I did use a few brad nails to hold it in place while the glue dries. 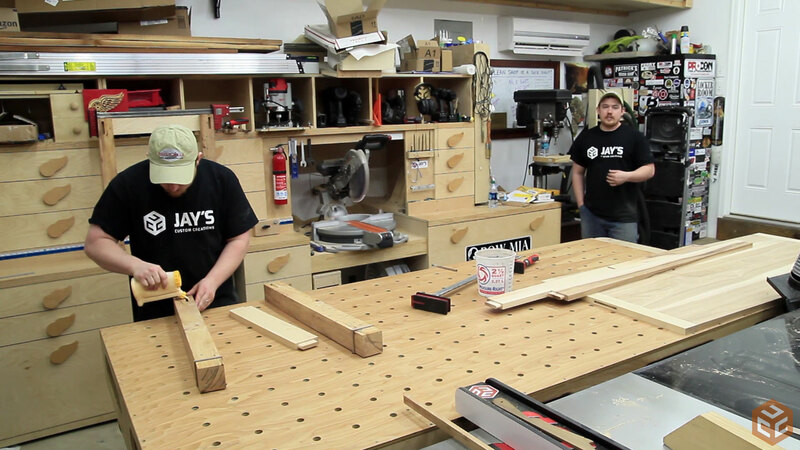 It’s the bottom side of the table so nobody will ever see the brad nail holes. 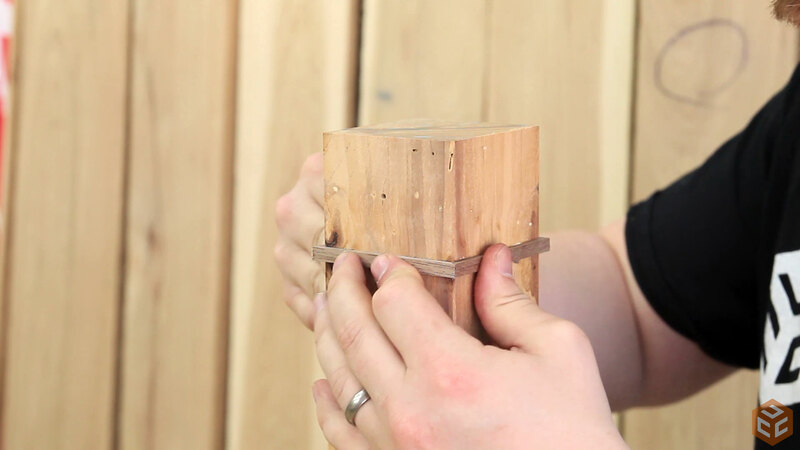 The glued mortise and tenon joints should be plenty strong enough but just for safe measure and a little more long-term insurance I added a pair of glue blocks to each joint. 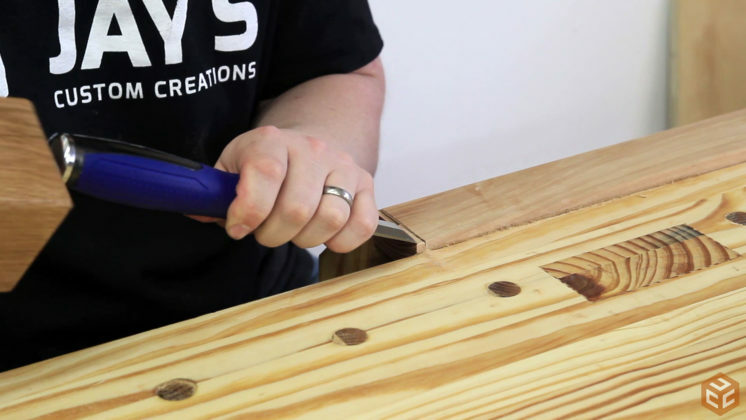 Plenty of glue in each joint and a few brad nails to hold them in place while the glue dries. 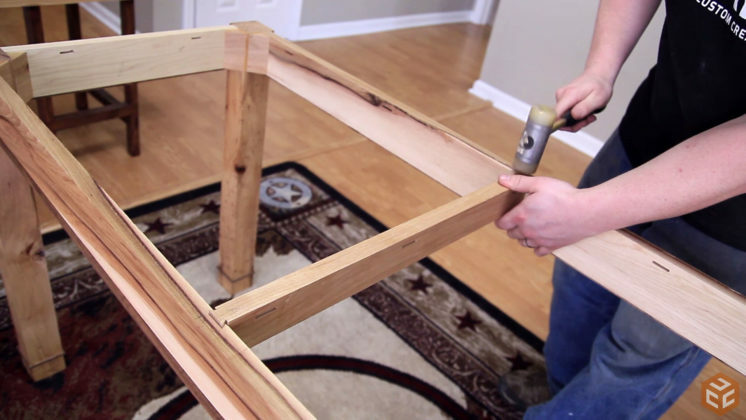 Any time you make a piece of furniture that has the potential to be pushed around or slid across a floor it’s a good idea to lightly chamfer or round over the bottom of the legs. This prevents the outside edges from touching the floor and potentially tearing out. 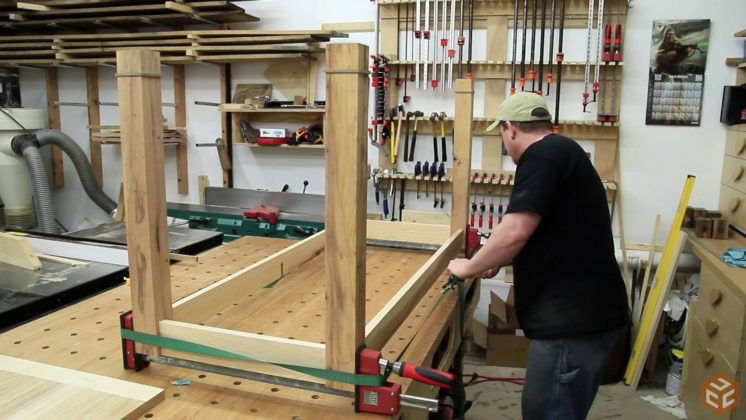 There are a few options to secure the table top to the base. I chose to use these table top hold down clips. I’ve been using them for years and it’s a quick and easy way to get the job done. 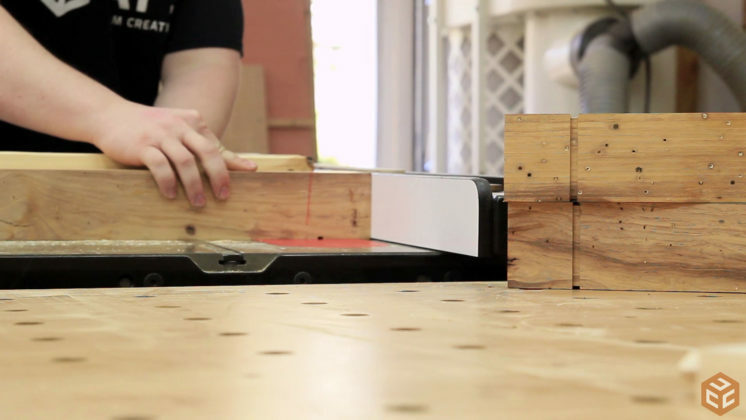 In order to use them a few slots need to be cut near the top of the rails. 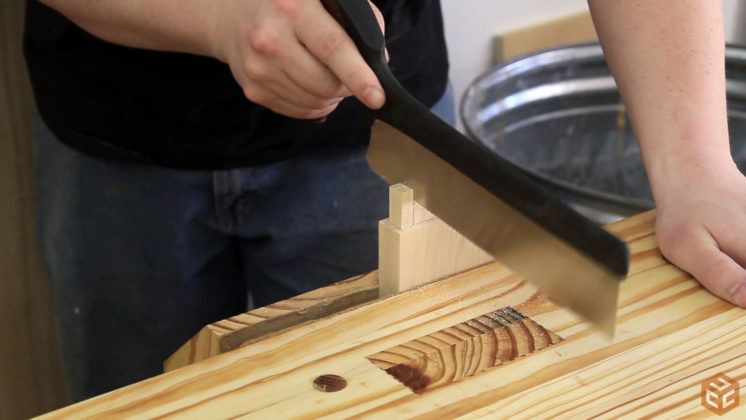 This can be done with a biscuit jointer, mortiser, or even a table saw by making a kerf cut 1/2” or so from the top of the rails on the inside. For a finish I chose to use satin water based floor polyurethane. 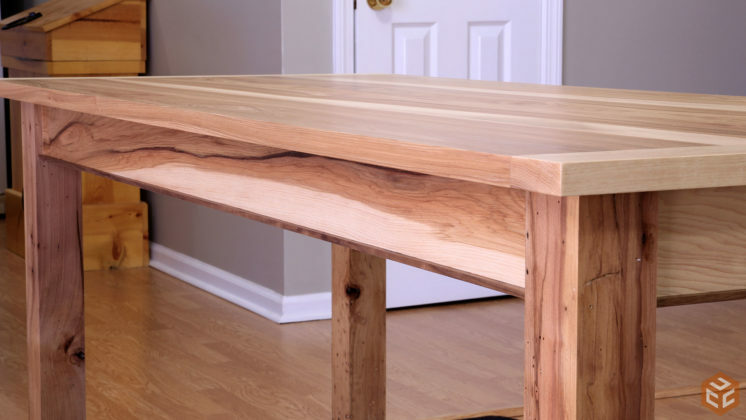 I’ve used it on several projects previously, including my assembly table that gets a ton of abuse, and have been really pleased with the results. And it’s water based so cleanup is easy. With the finish cured I assembled it in my dining area. Time to hide all the work that went into making those sliding dovetails. And the top can then be put into place. 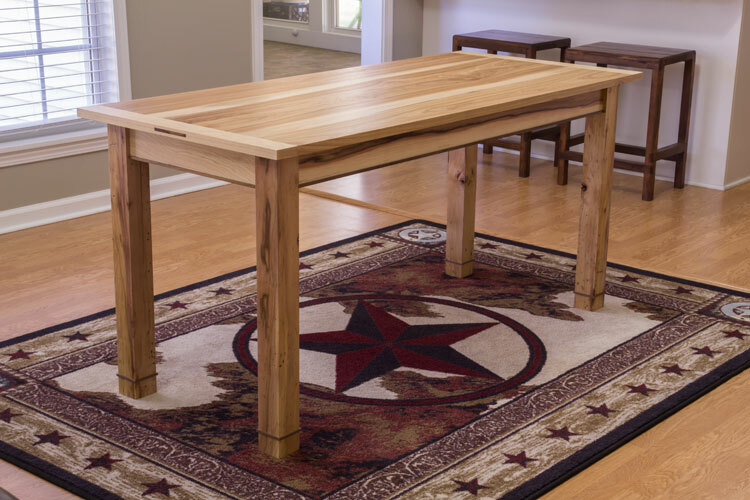 This table had several design changes and in the end we just went with a simple, traditional table. I’m very pleased with the entire result and due to the character in the hickory I’d say this is one of my favorite builds to date. Overall it has a simple look but there are a few subtle details that make this project worth it to me. The wedged through mortise and tenon sprung breadboard end table top turned out great and I’m confident that the joinery will last allow this table to be here for a long time to come. For those who are interested, I have a set of plans for this table that covers every detail of the table and has three size options. The plans are linked below. 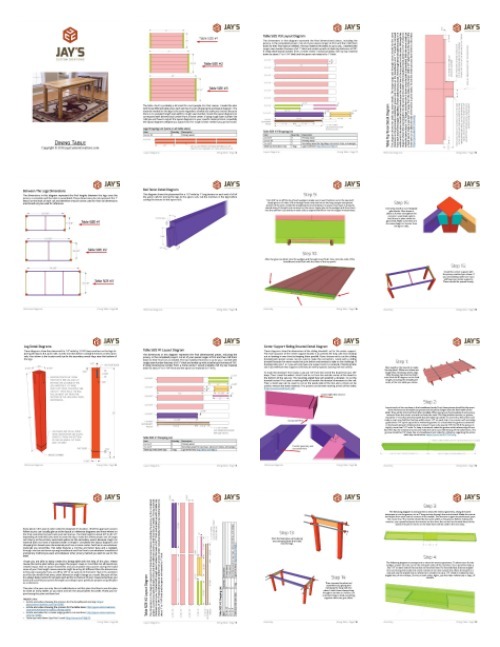 reference diagrams for specific part and assembly dimensions. Wonderful job man! The table turned out amazing! 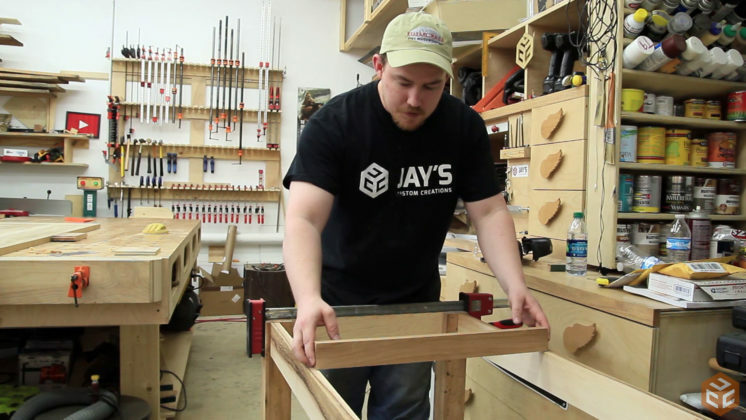 Great tutorial on table building, milling logic and grain selection. I believe the attention to detail and reasoning you provide is why you have such a growing following. Always something new to learn. Thanks! 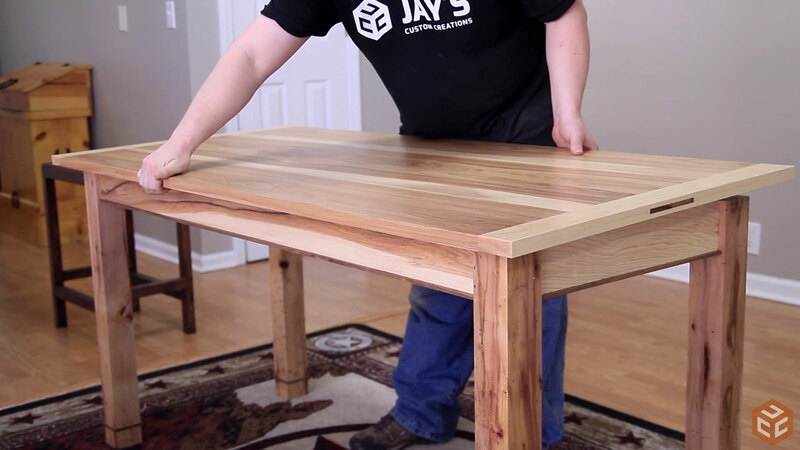 The grain in that table is gorgeous Jay. Nice job. Amazing job. My wife would like me build this table for our apartment, it’s just the right size. My God, that is beautiful Jay. Jay, first, sorry for the recent loss of your father-in-law. I was wondering as I read about this table project if you might have plans for a future build video of a large wall to wall built-in bookcase. Or, perhaps you are aware of another You Tube provider that has a video out on one. I know ther are lots of free standing videos on bookcases, but I have not found one for a large wall to wall one. Hmmmmmm. I don’t know of any off the top of my head. My wife want’s one in our spare room but I have no clue when I’ll get around to making it. Looks great Jay! Enjoyed the write up. The table came out fantastic. That lumber gorgeous. I agree the wood is doing the talking. Thanks for sharing. I hope everyone there is doing well. Fine job Jay. Your pride in your craft shines through. Thank you for your hard work and being an inspiration. Look forward to your next project. Well I guess and invite for dinner is out of the question !! Just kidding if I ever get down your way I will take you and your lovely wife out to a restaurant. I hope your wife is doing well after her loss , wish I could have sent more. GOD has a special place for him. 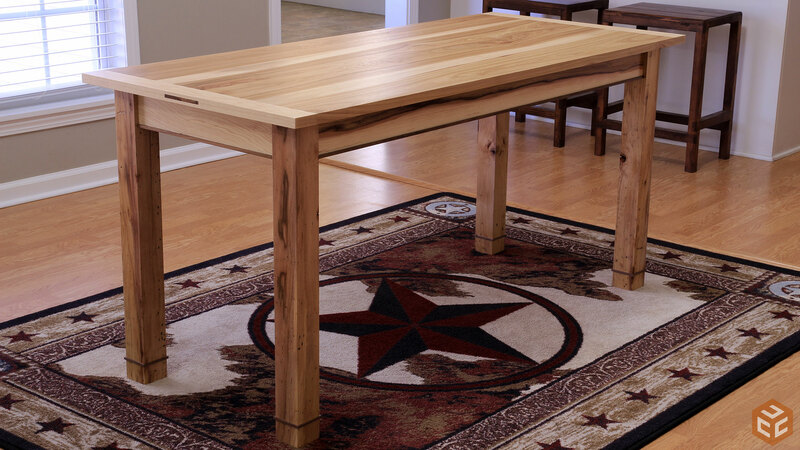 And the table looks great , always and education when you craft something. Jay, amazing table! 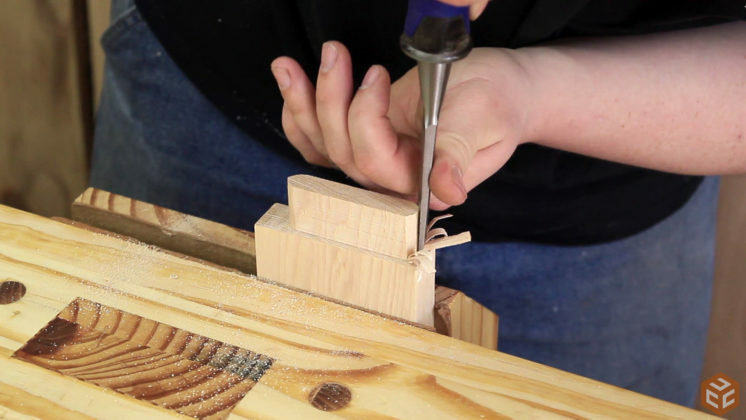 The sliding dovetail on the cross support remind me to some of the great techniques use by Doucette and Wolfe. Well worth the wait. 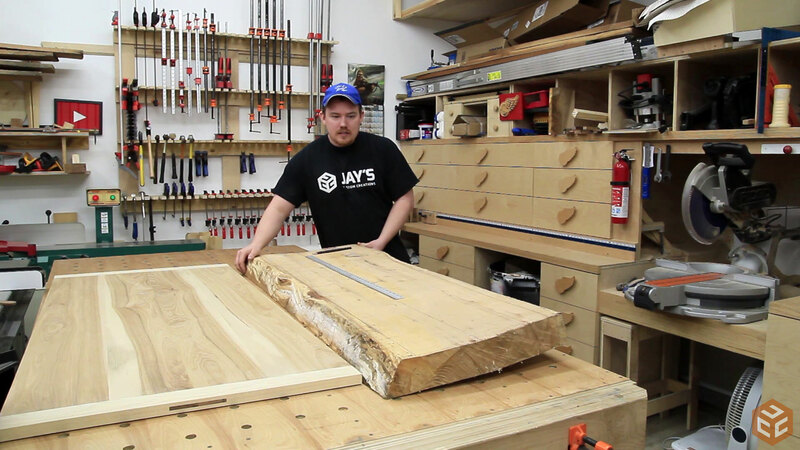 See what you have caused, now I have to find a 3″ thick block of Hickory. Thanks for the inspiration once again. Can’t help but point out your reasoning for using the planer to square the legs. That planer don’t care if the lumber is 6 in or 1/2in. It’s the amount you decide to take off. In my opinion……and I am known as an opinioned old SOB, it’s the right tools for the job. 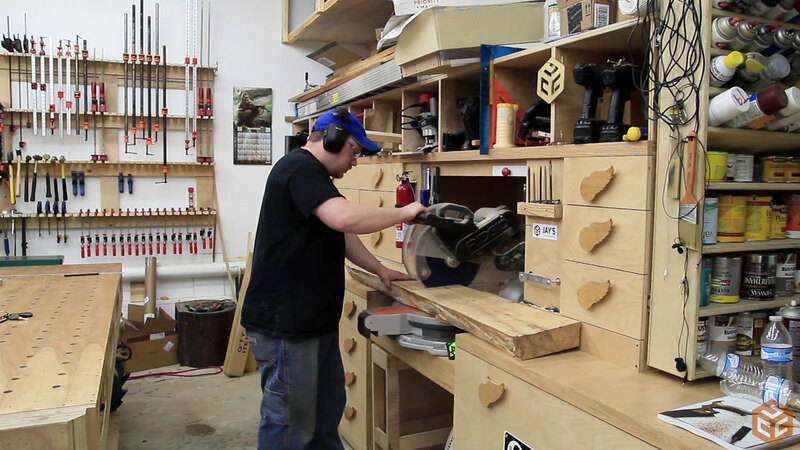 That much uncovered blade sticking up on the table saw scares me. Correct. However, the planer I have does not have durable blades. This hickory had some bug holes and other defects that I know would eat those blades for lunch. The wood is amazing. I like the walnut accent pieces on the spline, the leg inlays and the bottoms of the rails. Do you plan to use hickory for the two benches? Great stuff…….as usual. Great looking wood. Thanks. That’s a good looking table. One comment I have also like a lot of people have gone to the water based finishes. But instead of a brush to apply it I like to use one of those painters edge trim pads that fit in a holder with the rollers. Put your finish in a plastic container with some what high sides. Dip the pad into the finish , load it up and then pull across and top edge to get some of the finish off the pad. Then on the flat surface apply the finish cross grain about 2 or 3 pads wide from end to end . Then come back and pull the pad from side to side with the grain. You will find that there will never be any brush marks . It all so allows you to build up thicker coats and faster because of the size of the pad. Man, I need to get a table saw and a planer. 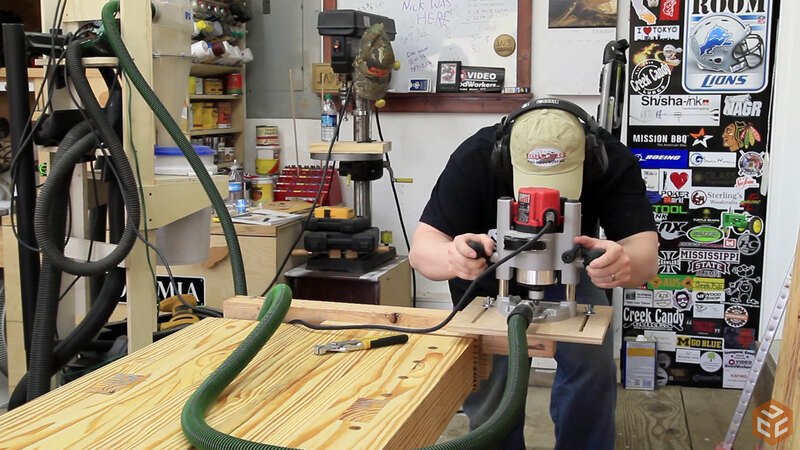 Those two tools really help bring out the beauty of the wood grain. I have the space for a table-top planer, but not a table saw. 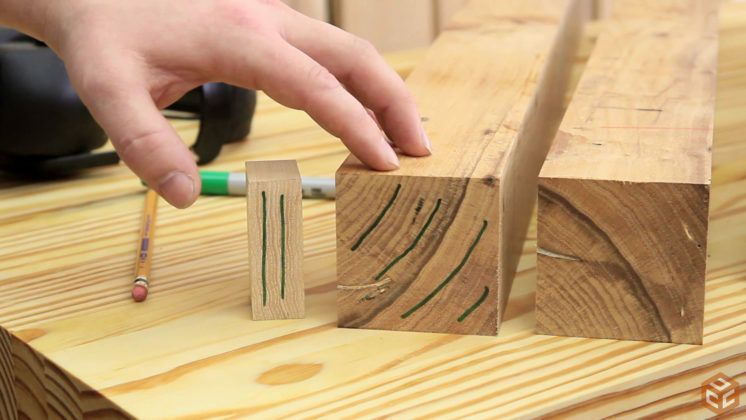 Do you have any concerns about wood movement with those breadboard ends? Hey Mark. The thought never crossed my mind. I supposed I can put something together. Your work keeps getting better and better! This is a beautiful build. Are you keeping a gallery of all your projects? I have been keeping images and happy to see my work get better and/or more challenging as I learn more. Thank you, Scott. This website is a living gallery of all of my projects :) Most of the items I make are made for a purpose like the bedroom furniture set I made last summer. I have all of those. I have given a lot of my stuff away though. 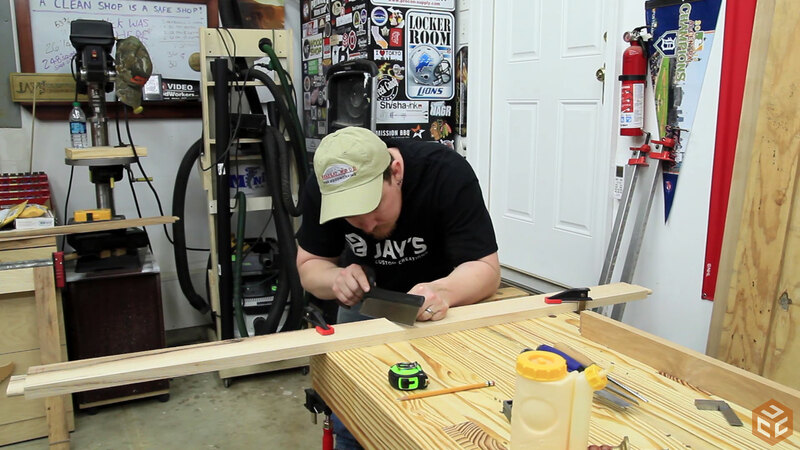 Dang…love the the grain of the wood on the table Jay!!.. your work is kickass! !..keep up the good work buddy..
What size chamfer bit did you use? About 1/8″ chamfer. I made it with a larger bit though. The table looks nice and strong! 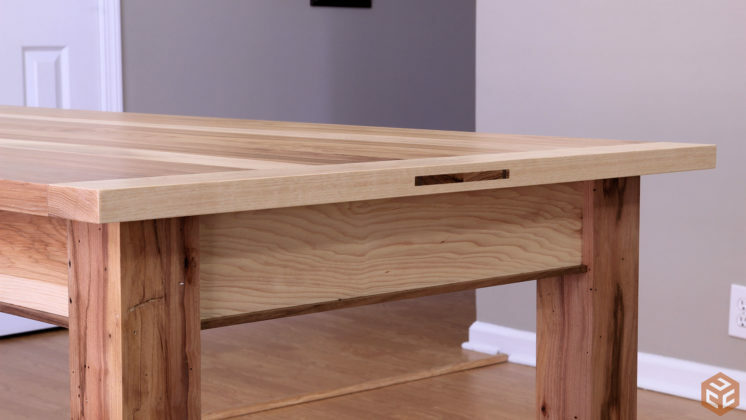 Just one quick question from a beginner, how many coats of poly you applied for the table top and frame below? Did you sand surface after each coating? Thanks for the sharing! I applied 3 coats. Sanded lightly with 220 between coats. 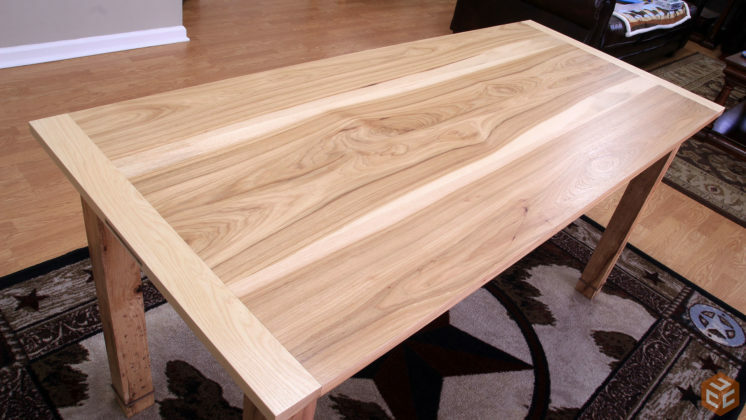 Okay… That’s a cool table ! I have been trying to design a smaller version of this myself and have been really waffling over whether to taper the legs or leave them “chunky”. Now that I’ve seen yours I sure do like solid look it gives it. Wondering why you decided to go chunky v tapered ? Thanks foe the video Jay. Oh, and good info about the grain on the legs, now it makes sense to me, all this straight, quartersawn sideways grain business, I never know what to do. Now I do.